Why Do European Zoos Kill Healthy Animals? : 13.7: Cosmos And Culture As a young lion is set to be dissected Thursday for the education of schoolchildren at a Danish zoo, anthropologist Barbara J. King explores differences in zoo policies in the U.S. and Europe. 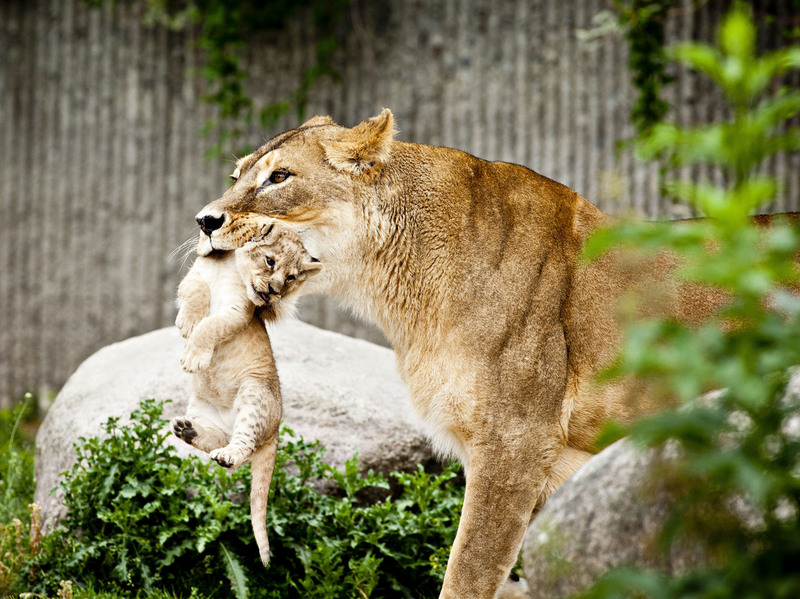 A lioness carries a cub at the Copenhagen Zoo in July 2013. On Thursday, the Odense Zoo in Denmark is scheduled to dissect a lion for the educational benefit of children on school holidays. The 9-month-old female lion was considered "surplus." Officials at Odense said they had too many female lions. They also were concerned about inbreeding, according to reports. The lion was offered to other zoos, but when no takers were found she was killed earlier this year and stored in a freezer. The zoo has been dissecting animals in front of guests for 20 years. The zoo's killing and dissection of this lion has outraged some, especially in the U.S. It's cumulative anger, because last year the Copenhagen Zoo carried out a similar double play — killing a healthy animal, Marius the giraffe, with a bolt gun and then dissecting the body in front of schoolchildren and feeding the remains to its lions. At that time, Copenhagen Zoo Scientific Director Bengt Holst came under widespread fire outside Denmark; petitions called for his resignation. But it's not just Denmark. The European Association of Zoos and Aquaria (EAZA) issued a statement on Tuesday supporting the Odense Zoo's plan. The statement notes that "culling of animals is one of a range of scientifically valid solutions to the long term genetic and demographic sustainability of animal populations in human care." It goes on to say that the dissection "for educational purposes is a valid choice of the zoo." In the U.S., the Association of Zoos and Aquariums (AZA) says flatly that incidents of killing healthy surplus animals "do not happen at AZA-accredited zoos and aquariums." The whole thrust of captive management in this country centers around birth control. Certainly, I can't picture elementary school children gathered at the Smithsonian's National Zoological Park or the San Diego Zoo to observe as an animal, once put on display to delight them, is taken apart joint-by-joint for their anatomical enlightenment. "When an animal's genes are well represented in the breeding programme and there is no place for the animal in another zoo, the European Breeding Programme has agreed that the animal is to be euthanized. We see this as a positive sign and as insurance that we in the future will have a healthy animal population in European zoos. The most important factor must be that the animals are healthy physically and behaviourally and that they have a good life whilst they are living whether this life is long or short. This is something Copenhagen Zoo believes strongly in." "In Copenhagen Zoo we let the animals breed naturally. With naturally we mean that they will get young within the same intervals as they would in the wild. That means that the animals get to carry out their natural behaviours." I'm struck by the terrible irony represented here: Zoos like this enclose animals in captivity, allow them to practice "natural behavior" of mating and reproduction, then slaughter them when they are no longer viewed as helpful to the project of coaxing visitors through the gates. In a televised interview from last year, Holst talks about the killing and dissection of Marius the giraffe, defending the "natural" act of feeding Marius' body to lions. "Why protect schoolchildren from real life?" he asks. But listen to the very first answer Holst offers to the interviewer. It is revealing: Children weren't invited to attend the slaughter of Marius because "when looked upon, the killing can be pretty cruel."